Secure all clothing away from the area to be tattooed and clean the skin with rubbing alcohol. If using a stencil or transfer, apply it to the skin once the alcohol has dried. Using an appropriate sized needle and a steady hand, apply the Jagua to the skin. Be sure to clean up any mistakes immediately with rubbing alcohol on a q-tip. Let the gel sit undisturbed on the skin for at least 2 hours. Peel the dried gel from the skin and wash the area with warm soapy water. 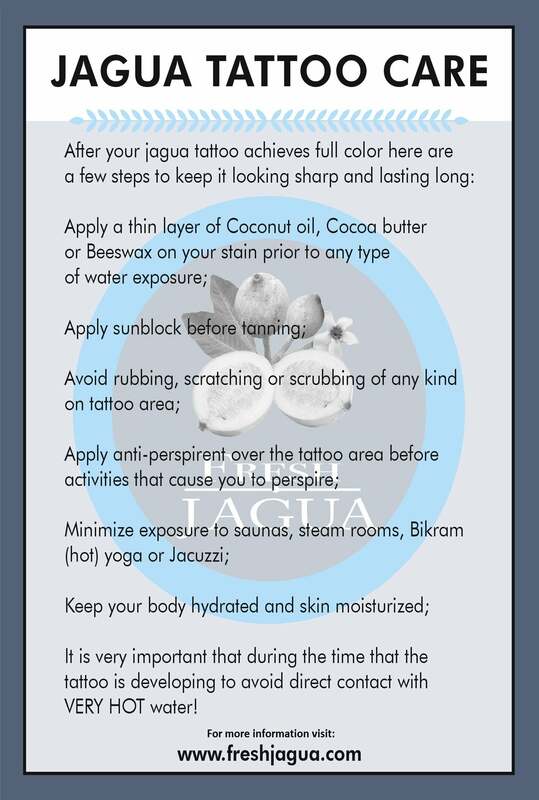 This is essential to keep any remaining Jagua from transferring to clothing or other parts of the body. DON’T PANIC! At this point, the temporary tattoo is just a grey shadow. It will develop over time and in 12 hours will be a beautiful blue/black color that may continue to darken for another 24 hours. Enjoy your Jagua temporary tattoo. Of course you are always welcome to freehand your Jagua temporary tattoos, but occasionally you will find a design that has to be just right or a customer who distrusts your artistic skills. In those instances, we prefer to create hand drawn transfers of our designs. Draw out your design exactly like you want it to appear in Jagua. Trace your design onto a piece of thin tracing paper with a pencil. Use craft quality tracing paper as the art quality paper does not transfer. Tracing paper can be purchased at any office store or the stationary department at your local drug store. Flip your tracing paper over and draw the design one last time using an ink pen (the cheap kind that smudges works best). Prep the skin by cleansing it with rubbing alcohol. Apply a thin coat of clear stick type deodorant to the desired tattoo location. As with anything you apply to the body, we highly recommend choosing a natural deodorant product. Lay the inked side of the tissue paper on the body. Hold it firmly in place to prevent shifting and gently rub each line so the ink transfers to the skin. Pull the tracing paper away from the skin in a smooth motion to prevent smearing. Apply Jagua Gel in the usual manner. If you have a computer handy and find an image you want online. Open the image in PAINT, go to IMAGE>STRETCH/SKEW to adjust size then IMAGE>FLIP/ROTATE>FLIP HOROZONTAL to create a mirror image. Use your ink pen to trace the image and pick up following the transfer instructions at step 4. Storing Jagua in a cool location will extend its life. If you are working in an area with out refrigeration, we have found the perfect solution to Jagua storage and it is less than $10! This ingenious idea is so simple; you can’t help but love it! Unless you like colorful hands, rubber gloves are highly recommended!